FARC, the terrible Colombian guerrilla, still exist but is generally off the main routes used by the travelers, hidden somewhere in the vast jungle areas. I said generally, because this story is proving the opposite. 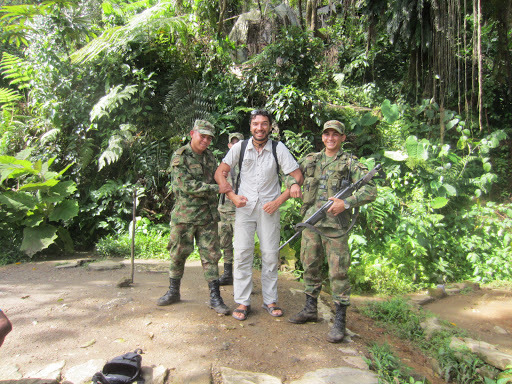 When I was in Mompox, along the Magdalena river, I met 2 friendly Israelis continuing their trip to Medellin. I didn’t manage to convince them to stay one more day in this quiet Colonial town, so they left the day before I did. But I arrived in Medellin only 4 hours after them… because they got stuck for >12 hours in their bus as the road was completely shutdown. On the main road the FARC stopped 2 buses, evacuate the people and burned the vehicles down. Nobody of the passengers was hurt but indeed is not a joke. To see how active the FARC is, you can check this Wikipedia article titled List of attacks attributed to FARC. – I’m glad I didn’t see this before going there 🙂 In other areas, like the one around Popayan, in the department of Cauca, taking a night bus is too dangerous to be recommended. To summarize: better to check with the locals if the bus route is safe and step out of buses if any soldier is asking. are you afraid of empty streets? It’s well known to don’t walk around alone at night in dark, empty roads. 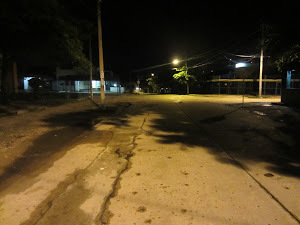 But never the less I found myself in the road here in the picture, at 4am, in Barranquilla, alone and tipsy. It was a stupid idea of course, but I remember at that moment I thought: “if I see someone, I’m gonna get scared to death. But if someone sees me now, it must get scared too!”. Then I decided that I would have robbed anyone approaching me. Robbers don’t rob each others, right?? Story #4: who robbed me in Colombia? Papaya is a fruit, yes. “Dar papaya” (give papaya) is a Colombian expression that means exactly “don’t give the bad guys any opportunity”. In Colombia you better don’t give papaya, but it’s appropriate to find a balance between don’t take risks and threat anyone like a thief, or your time there will become a nightmare. People are fundamentally good, I believe, and following this believe I could enjoy the humanity I met.